Dana is just a few years younger than me and he has also paid his dues while working hard to get into a business position to make a difference with his inner passions, experience level and intestinal fortitude. The UFC opportunity for Dana began ten years ago while Sports Techie is now 13 months old. Dana simply gets sports and technology and for that reason alone, he is a Sports Techie. Add in his billion dollar industry and he becomes an Ultra Sports Techie along with the likes of Paul Allen, Jerry Jones and the Steinbrenner family. 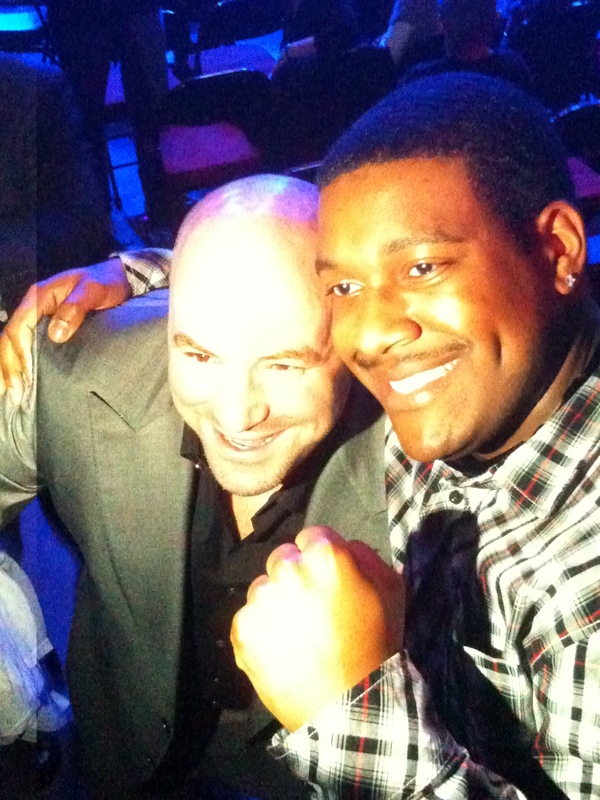 Without a doubt, Dana White is one of my new role models because he did it his way. Early on, he had a deal with HBO that collapsed because of philosophical differences in production. He knew what he had in the UFC and was laser focused to deliver the goods to fans that cared about MMA. I am the same way about sports technology and Sports Techie. I was talking to a best friend about the music they played as the fighters enter the arena and it turns out that Dana has the last say on even this smaller detail. Loved the driving hard rock tunes dude! What did Dana do to make this all so? He turned to pay-per-view years ago and the rest is as they say, history. Today at UFC.com, you will find a page that tells you ‘How To Watch’ and features three sports technology options for fans to be able to tune in via: 1. Online and Mobile 2. Cable and Satellite 3. At a Bar Near You. See http://www.ufc.com/event/UFN24. Spike-TV @SPIKE_TV has a reality show together with the UFC named “The Ultimate Fighter” which begins a remarkable 13th season this week. If you drill down on the UFC Fight Night 24 web site page you will notice that Facebook as well as UFC.com streamed most of the fights live. In fact, five of the 12 fight were carried on Facebook. 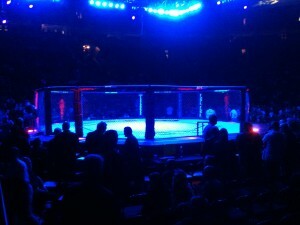 See http://www.ufc.com/event/UFN24#/fight. The last four fights of the evening were broadcast live by Spike-TV on the East Coast and delayed here out West. An usher at Key Arena told me that the 14,212 in attendance was the largest crowd since the NBA Seattle SuperSonics played there. UFC took in $1,182,550 for a fight card that underwhelmed in terms of talent but over delivered in sheer fight excitement. Innovative Dana paid the pair of the best fight of the night, the top knockout, and the top submission, a $55,000 bonus. To understand how important Dana is to the UFC success, simply look at his social media numbers. On Twitter, @danawhite has nearly 1.4 million users following him while @ufc has 229,000. The most successful technology tool that is working for the UFC is their Facebook Page that has over 5 million fans who ‘Like’ it. In comparison, our Sports Techie Twitter user account has 2,258 loyal followers and our new FB page at Sports Techie Facebook is 365 supporters strong. Lot’s of hard work ahead for Sports Techie to reach the UFC numbers but I believe and have faith that we will do it and so should you. Digital Royalty is a Digital Brand Management Company at http://www.thedigitalroyalty.com/. They develop Digital Integration and Social Media strategies for national corporate brands, pro athletes, professional sports teams and leagues. Digital Royalty works with clients Shaquille O’Neal, UFC and the Chicago White Sox, to help grow and monetize their digital brands. Their founder is Amy Martin. She works alongside Dana and the UFC as their Social Media expert. I have followed Dana, the UFC, Digital Royalty and Octagon Ring Girl Arianny Celeste, for over a year now. It was my goal to guerilla market for Sports Techie and somehow meet them all on Saturday night. Mission accomplished! My UFC buddy Ian who loves the UFC went with me to the historical event. A couple things about Seattle sports events: 1. A sellout is never a sellout 2. You can always move closer. We in fact, did both. After 842 extra tickets got released the day before the soldout fight on Friday, we had a way in. Once inside, we worked our way from the upper level to eventually sitting in the front row next to a 5-time world champion Muay Thai fighter who has a training facility in Las Vegas. From these choice seats, we watched Dana meet and greet many passionate fans with smiles, autographs and picture opportunities. I then met Amy and took a picture with her. Ian wrote his autograph for Dana to have on a piece of paper (lol) that he gave to Amy to give to Dana. Not much later, Ian told Dana himself that Amy had a note for him which Dana said OK, he would look for it. 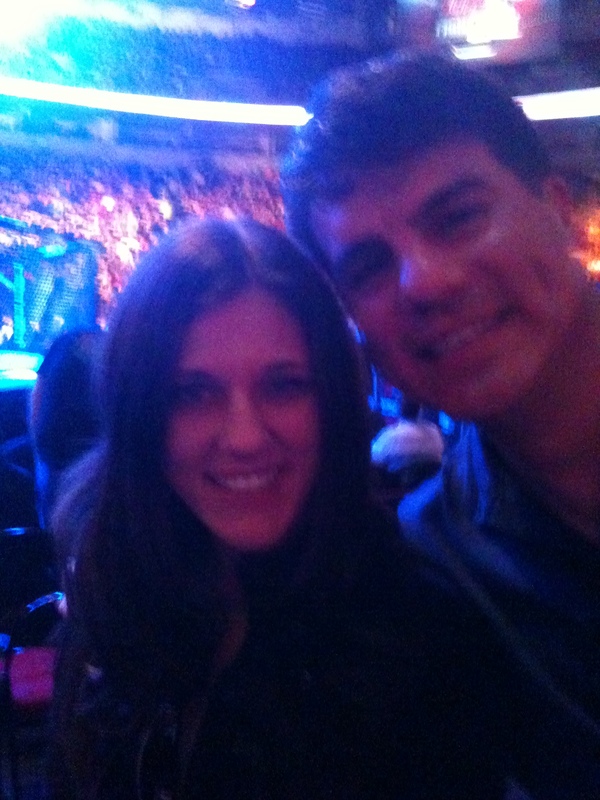 Finally, I introduced myself as Sports Techie to Arianny. 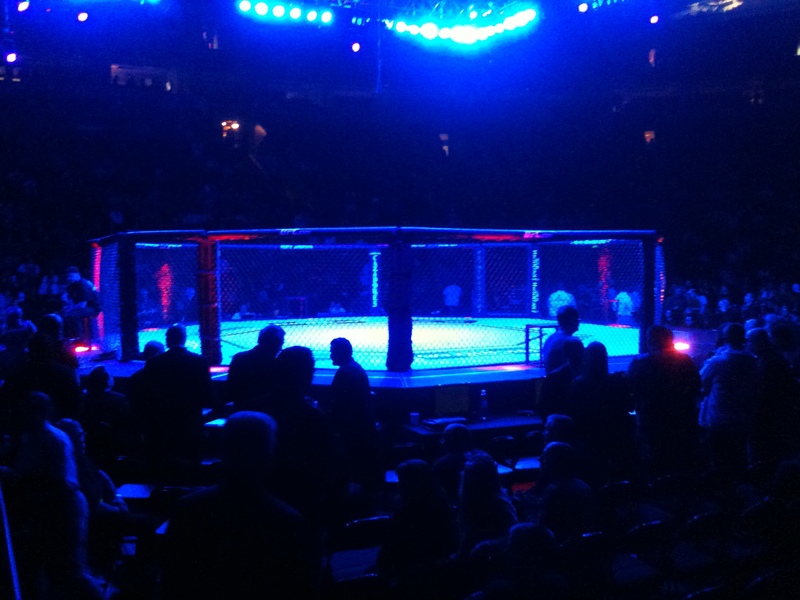 Sports Techie and the UFC are now kindred spirits. There are many reasons why the UFC is thriving. Timing, marketing, the fighters, the fans, and much more, yet, the one constant that has driven this business model forward besides Dana, is sports technology. Pay-per-view needs cameras, satellites, production trucks and televisions, to deliver the fights to fans. Social media needs platforms such as Facebook, Twitter and web sites, in addition, it needs Internet connections via PCs, Macs and mobile phones, to operate. Factor in advanced sports tech training products for the fighters, cutting edge venue technology like big screens, and video games for the fans. 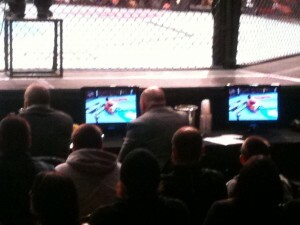 That said, Dana White, the UFC and Digital Royalty are indeed Sports Techie. For those of you who get ‘Sports Techie’ you are loved, and if you don’t, no worries, nobody got Dana White ten years ago when he first bought a failing company named the UFC. Look where they are now.